The Rhine embankment promenade vis-á-vis the Cologne Cathedral is currently being redesigned. The stepped facility is provided with a flood protection system constructed with precast components with an especially insensitive surface. The Rhine Boulevard in Köln- Deutz, as it is popularly named, the around 300 m long section between the Hohenzollern Bridge – Cologne’s famous railroad bridge – and Deutzer Bridge to the south, is nearing completion. When the water level is normal, the Rhine River flows about 7 m below the urban road level. Originally, the typical large boulders of which embankments on the Rhine River often consist were visible. The initial promenade was just below street level; at water level, there was an unpaved tow path. In 2011, the Berlin-based architecture and space planning firm Planorama had won the competition for the new facility on the Rhine River with the now implemented concept. It is based on the idea that the here steeply inclined terrain is to be provided with stepped Uferbefestiers, like a Roman theater. The difference in height is now overcome with nine steps, each about 0.5 m high. They stand on an around 3.50 m wide boulevard, approx. 2 m above water level. The new path, which is also constructed of concrete components, cantilevers slightly over the water so that the rock embankment below, on which it stands, is not visible from the path. The step cascade that runs parallel to the embankment is broken up by several wide flights of stairs over which the lower level of the boulevard can be comfortably reached and which, moreover, ensure easy access to the intermediate levels. At the ends of the path, the embankment promenade rises at a handicap accessible incline to street level. The platform on each of the nine large steps allows wheelchair users to take their prescribed rest as well as providing access to the intermediate levels. The planners had precise ideas about the surface quality of the step elements already when they submitted their bid. The NCS Shade (NCS- S-1502-Y) of the precast components, for example, had been precisely formulated as a light gray creamy color tone. The same applies to the surface finish and the concrete quality. The elements were to have a roughness of R11 and a final strength of C35/45. The companies Hochtief AG and Bunte GmbH entered into a joint venture, ARGE Rheinboulevard, to implement the concept, of which the large stock corporation would be primarily in charge of the non-civil engineering works and the company mentioned in second place in charge of the actual embankment stabilization. The contract for the manufacture of the precast concrete components was awarded to Lothar Beeck Fertigteilbau based in the German city of Mönchengladbach. The family-run company was founded as a construction company 45 years ago and specializes in recent years increasingly in the production of precast components. The son of the founder and today’s Managing Director Marco Beeck sees the competence of his plant primarily in the production of architectural concrete. Here, he said, he can still fully bring into play the advantages of a highly qualified staff. Many other concrete products are in his opinion nowadays nothing but mass-produced goods. Frequently, a favorable price is the only factor for contract award, the savings of which moreover often amount to no more than a few cents. He manufactures of course, he continued, standard products as well, for example, for Deutsche Bahn or RWE, one of the leading providers of electricity and gas. Currently, however, this portion is shifting in favour of the high-quality concrete components, says Beeck, obviously pleased. The entrepreneur really lives his product and is always open to experimental approaches. One example of this is the support he gave to Prof. Heike Klussmann of FH Kassel University of Applied Sciences and her transdisciplinary research group “Bau Kunst Erfinden – Building Art Invention” for the “Blingcrete” project three years ago. Currently, Beeck supports Klussmann’s research group in their experimental studies on “DysCrete,” a concrete with which energy can be generated using organic dyes (see Jahrbuch Beton Bauteile 2015, p. 154 ff.). For the Cologne Rhine River Boulevard, other than for other projects from the field of garden and landscaping construction (GALA), no compacted gravel or sand was used for the substructure. Instead, the client, the city of Cologne, given the danger of flooding, decided on an all-concrete solution. The final course was to be capable of being flooded without displacing the precast concrete components. The substructure was implemented using a mixed construction method of in-situ concrete and precast concrete components. Precast concrete beams were installed on the subgrade in the steeply inclined areas and the horizontal surfaces in-between, for example, on the wide promenade, topped with a horizontal layer of in-situ concrete. The areas created in this manner were carefully smoothed and levelled to enable precise placement of the precast concrete elements on the visible surface, which operation was monitored by a levelling instrument. Depositing the step elements weighing around 5 tons was a logistic challenge, since the precast components were not allowed to have holes for attaching transport anchors, and textile tapes around the elements could also not be used for understandable reasons. 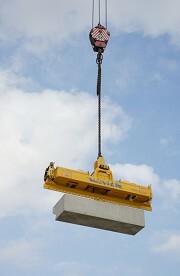 The solution was a vacuum lifter, similar to a glass suction cup, from Vietz GmbH that is able to lift precast concrete parts up to a weight of 16 tons without leaving marks on the surface. “Virtually everybody can pour concrete into a mold – all one needs to know is what little screw needs to be turned for achieving a specific goal,“ is Beeck’s motto. One of the specifications that called for delivery of the precast components in a specific NCS color shade, however, challenged his ambition. Here, his investment in modern mixing technology paid off. The core of the plant is a Teka pan mixer which, in conjunction with a modern PLC from Sauter in Wutöschingen, microwave measurement technology from Ludwig, and a high-pressure mixer cleaner from Walther, exploits the currently available technical possibilities to the maximum. All of this together provided the prerequisites that enabled the Lothar Beeck Fertigteilbau GmbH to produce the 1,795 precast concrete components with a total weight of 4,750 tons of uniform color shade and to deliver them just-in-time. 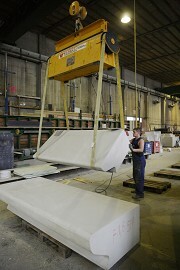 All of the precast concrete elements were manufactured overhead. To ensure a surface quality as uniform as possible, XXL Westoplan form panels from Westag were used for horizontal casting. Although these large area form panels are extremely difficult to process, the stable quality achieved with a hard fiberglass gelcoat surface more than justifies the extra cost. The in part three dimensional form of the front edges of the steps were milled on a 5-axis CNC plant and, together with the form panels, form a perfect combination. For casting, the experienced concrete workers use a trick that appears to be almost banal and has a high added value: Directly prior to casting, they push a loose form panel of perhaps 1 m² size provided with 16 holes the size of a beermat over the intended casting area. In this way, the concrete is distributed through several holes and flows uniformly around the reinforcement, instead of flowing in a concentrated stream into the form. The unsightly concrete circles that often occur and are viewed as defect are, indeed, prevented in this way. The concrete mix of gray and white cements is characterized by high early strength that attains approx. 30 N/mm² after two days. Beeck assumes that the concrete, once fully hardened, attains a value of between 60 to 70 N/mm² and thus considerably above the required C35/45. As gray cement, Marco Beeck used a very light CEM I 52,5 R from Dyckerhoff AG’s Geseke cement plant, and, as white cement, a CEM I 42,5 R Face from Dyckerhoff AG’s Amöneburg plant. Following curing, each of the overhead produced elements is turned around using a load turning device from Vetter Krantechnik GmbH and placed on a separate pallet for acid-etching. The Mircrogel from Hebau GmbH used for this purpose is a gelatinous product based on hydrochloric acid and is suitable for effectively acidifying not only horizontal, but also vertical surfaces. For the three-dimensionally formed step elements of the Rhine Boulevard with their rounded front edges, the gel was applied three times and after every application after a short exposure time washed off by high-pressure water jetting. This chemical treatment makes the precast components look classier and considerably more insensitive. The reason for this is that the acid removes the uppermost layer of the cement that is especially smooth and prone to pollution. The acidified concrete surfaces are so robust that Beeck currently does not expect that his precast concrete components on the Rhine Boulevard get another protective coating. Tests performed by the city of Cologne showed that surfaces defaced by graffity can be easily cleaned without additional coating, leaving virtually no residue. An application of hydrophobation or a graffiti protection is basically possible in-situ. But Beeck, considering the high quality of the precast components, does not expect to be awarded a contract for this. The Cologne Rhine Boulevard seems to be the perfect grandstand, already now, for enjoying the view of the cathedral city, for example, at sunset. One thing, however, seems to be sure: at future large-scale events in the Rhine metropolis, for example at the city festival “Cologne Lights,” the nine tiers of around 300 m length will be occupied to the last seat.